Bad news for the theoretical handful of people still attempting to enjoy PSN downloadable game Calling All Cars: The game's servers are only a few months from permanently disappearing. 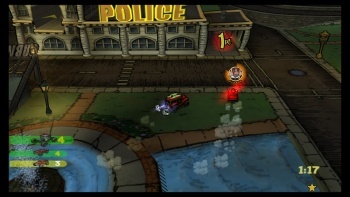 Specifally, January 14, 2010 marks the end of the road for the cops n' robbers themed title from perennially tantrum-prone God of War creator David Jaffe. There seems to be no online playerbase for the game currently, so while we don't expect much weeping and gnashing of teeth following this news, it should be pointed out that this is the first time a PSN game has had its backend hardware taken offline. Calling All Cars obviously wasn't the runaway smash hit Jaffe and his wee kin in The Shire had hoped it might be, but there is a certain cachet to being the first to fail so immensely, right? It's like the gaming equivalent of being Peter McNeeley. Yes, you're always going to be known as the goofy white dude who only barely avoided being decapitated by an angry, post-prison Mike Tyson in less time than it takes to find your car keys in the morning, but at the same time people totally know who you are!